Mrs. Ella Westin, well, at least she’ll be that if she can ever get married, is dealing with trying to get married in spite of the fact that her maid of honor has just been found dead – and she wrecked the wedding cake at the same time! Can a girl ever get a day off? 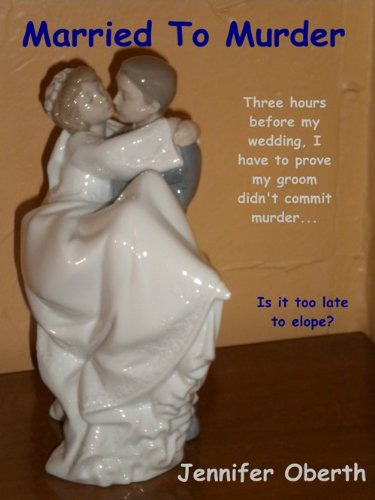 Ella has a limited time to prove that her groom is not in fact the murderer – if she still wants to get married today! This completely unique and cozy mystery follows Ella throughout the day of her wedding as she tries to determine friend from foe, in-law from out-law. Who killed her? Who had the opportunity, the motive, the frosting? A breath of fresh air, this wonderful (albeit short) book is part of a series of stories surrounding Ella and her life in “historical” times. It’s not necessary to have previously read the other books to understand and follow the story. The dialog is witty and the writing excellent. Don’t let the cover fool you, there is greatness in these pages. A fun book from a very talented author. The best self-published book reviewed in 2016. "How inconsiderate to die on my wedding day. She knew this meant more to me than anything, so she ends up murdered under my brand new shoes." Jennifer Oberth is a sweet, gorgeous, intelligent gal with a great sense of humor. She likes to take long walks on the beach where she thinks up delicious ways to murder people and give them motives, means, opportunities and fake alibis. Don't randomly ask her what she's thinking because she'll tell you. She doesn't want a repeat of that time she was with a group of strangers and she blurted out her frustration at her car. "How on earth am I expected to kill somebody in the woods without being seen when I can't turn off the automatic headlights?" She didn't know why they shrank back and gave her a wide berth the rest of the evening. She didn't know why no one offered advice to get around this tricky annoyance. It's a coincidence she then started writing cozy mysteries set in 1875… Jennifer Oberth (the sweet, gorgeous, intelligent gal with a great sense of humor) has two cats (Copper & Outlaw). When she's not at work, cursing the computer when it doesn't work, she can be found at home, cursing the computer when it doesn't work.